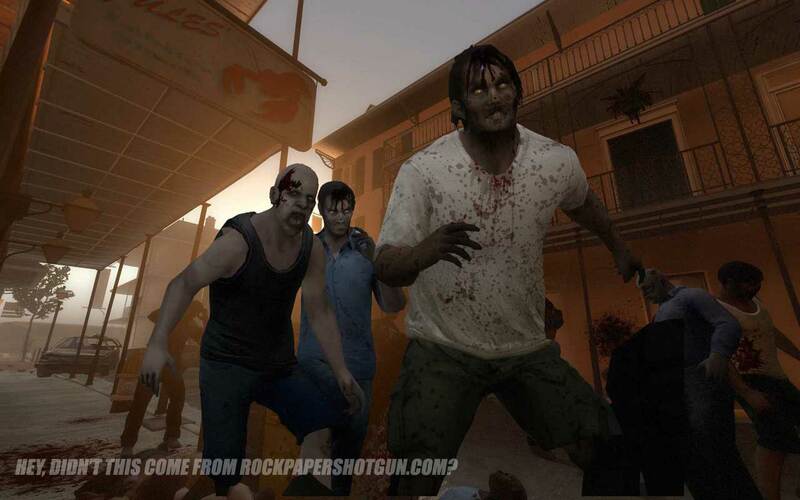 Left 4 Dead who now? No one was expecting Valve’s next game to be a sequel to 2008’s awesome co-op zombie shooter, Left 4 Dead. To answer your immediate question: Yes, this is a completely new game, with new characters, in a new location, with new zombies, new weapons, new twists, and an improved Director, in five completely new campaigns set in the Southern United States. This isn’t more maps for the previous game, it’s a brand new game, and it’s due this November. We snuck into Valve HQ ahead of Monday’s announcement and played a full campaign, and at first glance much appears to have evolved. It’s still Left 4 Dead: Valve have more sense than to change anything that made the first game so splendid. 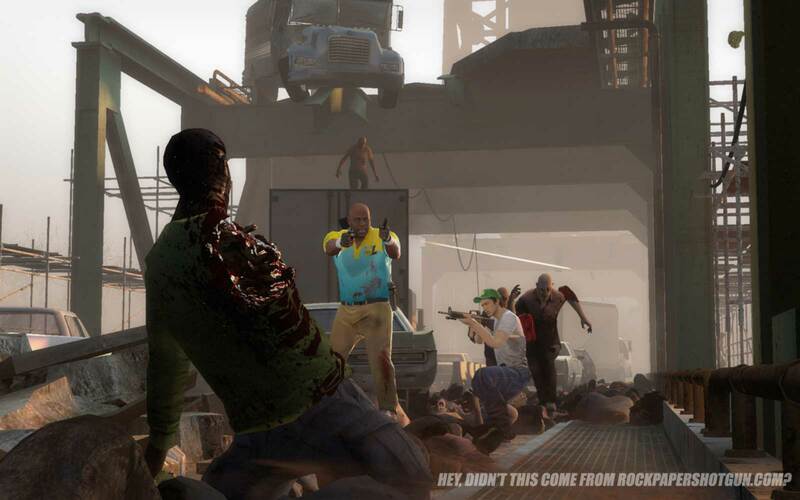 Rather the focus on L4D2 appears to have been the desire by everyone involved in the first game to make something bigger and better. Coming off the back of the project, we were told by various Valve developers, people we bursting with ideas of where to take the game next. So they went right there. The plan for the five new campaigns is to bring them together more coherently, so you can more obviously see how the events of one lead to the beginning of the next. Nothing that will enormously impact on jumping right in to a game in a particular stage, but giving a stronger narrative logic to the complete game. And with that, the new cast will also develop their personalities as things progress. Coach looks set to gain bravery as he gets closer to New Orleans, while Nick’s attitude to the others may soften. This will be born out in a more elaborate and involved collection of dialogue barks, once more primarily away from the player’s control. Perhaps one of the most endearing aspects of L4D was the characters’ surprisingly apt and timely remarks about the events, and occasional exchanges. This is to be expanded upon, with many more back-and-forth moments of chatter appropriate to the events happening around you. Beyond the new cast, nothing else from L4D is being replaced, but rather added to or expanded upon. So the Special Infected we’re already familiar with will appear, joined by a new collection. Of these only one has been revealed so far, The Charger. Looking like a crossbreed between a Tank and a Common Infected (what an unholy union that would be) the beast has one giant mutated arm, which he uses to shoulder-charge the Survivors. He knocks you down, but doesn’t incapacitate you. Rather you’re off balance for a moment. As happened to us as we played with Valve designers, he’s capable of taking out many of you in a single charge, sending us flying like bowling pins. However, should he charge someone on their own, rather than running to hide after, instead he might pick you up with his giant arm and repeatedly smash you face-first into the ground until a teammate comes to rescue you. While other Specials aren’t yet shown, we have seen some changes to the familiar. Rather cutely, some of the Common Infected have been changed while in hazmat suits. This means laying down walls of Molotov cocktail fire won’t keep everyone away any more, as the fire-proof baddies can run right through. The pay-off for this is exploding their heads and seeing the goo splat against the inside of the perspex visor. But perhaps most exciting is the Wandering Witch. 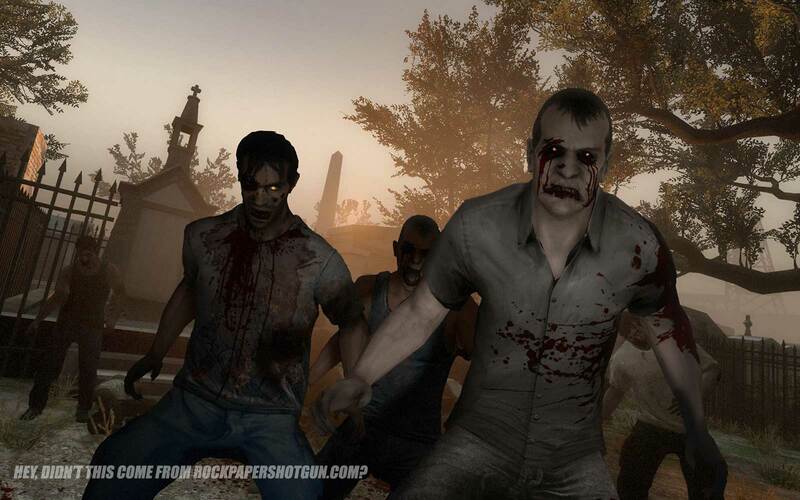 Another new feature of L4D2 is setting some of the campaigns in the daylight. The campaign we played was such, and it’s oddly frightening to see it all happening while the sun shines. Making our way through the sprawling streets of New Orleans, desperately trying to reach a distant bridge at the other end of which was lay an apparent helicopter rescue, the only time we needed our torches was when making our way through buildings. And it seems in the daytime, the Witch has a bit more pep. Rather than sitting crouched, sobbing, singing, now this most terrifying of gaming enemies methodically paces around, wandering where she sees fit, although still apparently zoned out. She may be on foot, but she’s no more interested in being disturbed. This adds in a whole new aspect to Witch evasion. No longer can you simply take the long way around where she’s squatted. Instead, she may well be walking exactly where you’re headed. Or worse, walking up behind you, singing her haunting song, suddenly infuriated by you when you swing around in terror. The Witch’s capacity to create anecdotes seems only more powerful now. Sitting down to grab some food with a collection of Valve, stories about their most frightening or plain inconvenient Wandering Witch stories flow freely, each explained in animated terms. Of the new weapons, perhaps the most exciting reveal are the melee tools. So far we’ve seen the axe and the frying pan. Yes, the frying pan. Feeling like a sneaky bit of TF2 in the game, it’s the perfect comedy weapon, that somehow doesn’t feel irreverent in a way inappropriate to L4D’s more sullen world. Complete with a fantastic KWAPANG noise, it’s extraordinarily effective to bat your way through crowds, and can even be used to knock a Hunter off a pinned Survivor. There’s also a baseball bat, which didn’t appear in the campaign we saw, which we assume will be a little less bonky than TF2’s Scout’s. And the chainsaw, which again we haven’t played with, but hell: there’s going to be a chainsaw. The axe can’t go unexplained either. It’s utterly brutal, and shows off the Infected’s newly regioned vulnerability. Swing it low and you can slice off a zombie’s legs, letting them collapse horribly to the ground, bleeding out of their fresh stumps. Or maybe swipe off either arm. Or most horrendously of all, remove a face. This same gore is achievable with all the weapons, with new ragdoll deaths for the throngs, to make their entrail-spilling, armpit-dribbling, face-exploding ways all the more entertaining. There were many gasps and cries of “OH GOOD GRIEF!” as we played, the strings of guts slopping wildly into the air, or as mentioned above, the faceless leaking mess suddenly bursting like a blood-filled balloon as the Infected fell to the floor. It’s awesome. There’s a new shotgun, a new semi-automatic, and a brand new sniper rifle. This last one feels dramatically out of place in a game where you can’t stand still, but it seems extremely likely that this will be the weapon that will be used most skilfully. Obviously powerful, it’s a very useful tool when you find yourself in one of the new “gauntlet” moments. Gauntlets are one of the new elements that will occur, as one of many moves to attempt to make L4D2 a more consistently thrilling experience. In the final moments of the campaign, finally reaching the bridge, we had to cross it. At the other end lay the potential of rescue. But it was one long, straight, inescapable path down which the Director was able to screw with us as much as ‘he’ liked. Standing still was never and option, but trying to stay high, jumping from roof to roof of the vans and cars, very much was. Someone sniping from the back here proves helpful, while a couple of at the front wielding axes or frying pans was equally effective. These make for interesting moments, an almost unrelenting onslaught from in front, but the peculiar safety of knowing that nothing you didn’t let get past you would be attacking from behind. Another very smart change is to prevent sneaky players from trying to sit out the triggered events. In those moments in L4D where you had to press a button that began a frantic attack until an elevator arrived, or a door opened, it seems too many were crouching in a corner together and waiting for it to all die down. 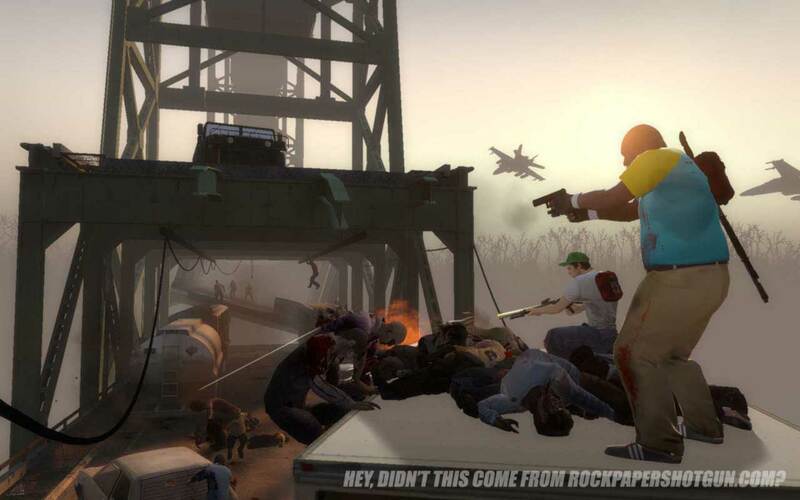 L4D2 has plans to prevent such treachery. Now some of the events you start can only be stopped by reaching a further target. In an extremely tense sequence, we had to make our way through a labyrinth of alarmed cars to reach a distant point that would finally see the attack fade. Trying desperately to avoid hitting any of the cars, and thus making the situation far worse, while having to make constant forward progress, amped things up significantly. The Director even has discretion over the layout of certain sections of levels. In New Orleans we reached a graveyard that is different each time you play. As Valve explained to us, if the Director gives you a pretty straight route right through it, it’s an insult to how poorly you’ve been playing that the omnipotent AI thought it needed to make things a little easier for you. If you’ve won his robotic respect, then it’ll be a far more convoluted journey. While there’s no intention to waste players’ time with dead ends, there is a greater emphasis on rewarding exploration. You may well learn the correct route through most of a level, but heading off down a longer pathway, or going to check out an out of the way room, is more likely to be beneficial. The Director is, we’re told, going to be far smarter this time about placing items, and the selection of these has expanded as well. Which includes the incendiary ammo. Oh, what a pleasure it is to find these beauties. Like an ammo stash, incendiary bullets can be picked up from tables, etc, and will give you a clip of ammo for your current weapon that will set absolutely everything it hits on fire. Which is spectacular. Right up until you accidentally set a Charger alight and he comes bounding toward you to share it. Everything seems bigger and better. And this includes the number of Infected to kill. The average number taken down in a campaign in the first game was around 1000. In our play through one of the sequel’s five new chapters we clocked up around 1700. Due November 17th this year, it’s quite remarkable that it’s so far on already. And frankly, that of all developers Valve have made something this quickly is almost dizzying. While there’s obviously going to be something of a fuss made over people’s expectations that L4D would be constantly expanded for free, following the TF2 model, it’s important to stress that while this is obviously still the same L4D core experience, it’s certainly not a bunch of new maps thrown into the old game. It’s a coherent new imagining of the game, this time bigger, smarter, and far more elaborate. Oh, and gloriously more gory. To find out even more details, be sure to listen to our world exclusive developer interview with project lead, Chet Faliszek, in the latest podcast. Tagged with feature, Valve, Left 4 Dead 2.